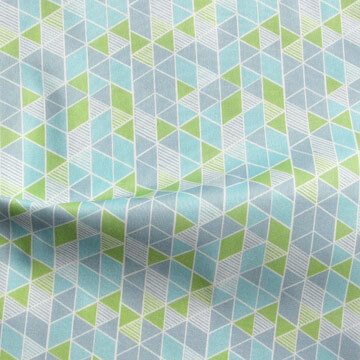 Recently, I received an email asking about Haiku in a Prism, one of the Gems pattern colorways I offer on Spoonflower (a digital fabric printing website). Based in Malaysia, this buyer was interested in ordering the pattern on upholstery-weight cotton twill, and wanted to know if I was willing to scale it up for the project. Of course I was! 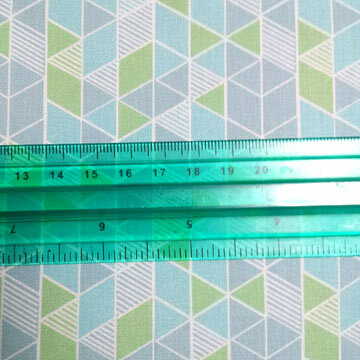 We exchanged a few more emails involving photos of an English/metric ruler and paper printouts of the pattern. We decided to enlarge the repeat from 3×3″ to 11×11″—almost four times the size. Then I made a temporary change to the scale of the fabric on the Spoonflower site (having refined a few details to make sure the bigger shapes would hold up). I waited until she received the shipment before changing it back, just in case there were any issues that required a reprint. 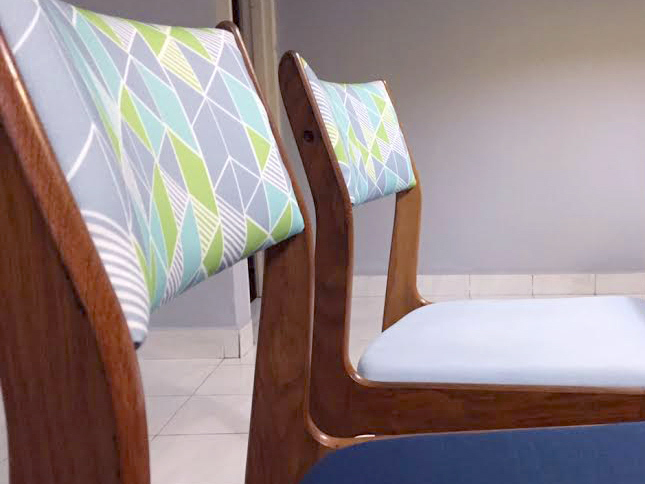 When she got the chairs back from the upholsterer, she was kind enough to send a friendly note and a couple of photos. Order Gems fabrics on your choice of high quality fabrics, including organic cotton, silk and canvas, by clicking the links below. Feel free to contact me if you’d like custom colors or scales.